With Christmas over and New Years upon us, I am starting to work on Valentines Day cards. 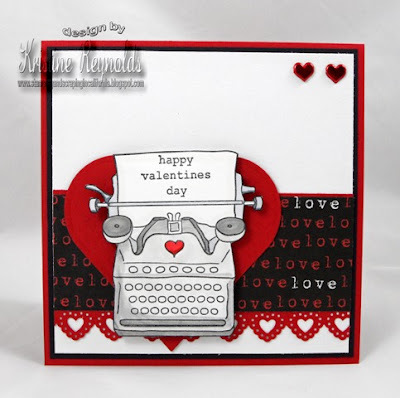 I am doing a stamping workshop in a couple of weeks and this is one of the cards we are doing. I would love to hear what you think of this card AND...whats your favorite card making occasion. About a week ago, San Diego had a rain storm that really took its toll on a lot of people. Because of this, Melissa and her work studio was under 2 1/2" of water. For some of you, that doesn't seem like a lot, but it did create a lot of work. On Sunday myself and a few other friends helped her take everything out of the studio, including furniture. Her studio will be under construction for the next couple of months, I'm sure. We did manage to squeeze most of it in the garage and give her a little table space to work. Throughout this whole process, Melissa decided to purge some of her paper and old stamps, and I gladly gave them a new home. I started cleaning out one of the boxes and came across this cupcake from the Hey Cupcake set that Melissa had colored and coated with Glossy Accent. I decided that it was too pretty to toss and I had to use it on a card. 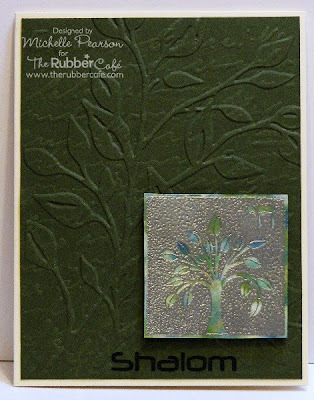 I used one of the new lables from Spellbinders, Labels Fifteen, and embossed the cardstock using two different sizes. I stamped the inside with one of the Card Label stamps and Eat Cake. I really love how it came out. Thank you so much for stopping by. Keep coming back. There will be so many great new things happening with The Rubber Cafe, and you won't want to miss it. I hope you all had a wonderful Christmas and that you are up to non Christmasy cards for the months to come! Like this fishy card! I used the Fishing for Details set, it’s sooo much FUN!!! I stamped on white cardstock and colored with Copics. The fish is cut out and adhered with pop dots for some dimension. Easy peasy! All the squares are cut with Spellbinders Nestabilities and then some bling in the corners. Done. Have a lovely last week of 2010, see you next year! I have a friend who has a birthday in January...and she was asked once if she was my *mother! * The poor dear is only six months older than me! We (or maybe it's just me) still get laughs out of that one....so I thought these sets were perfect for me to tell her that she's well preserved! I stamped the Mini Jar on acetate with black Stazon ink. I stamped the lid on designer paper. I attached my lid to my jar and then to the pink panel. I added some paper embroidery to further give it a vintage feel. The fruit from the Fruit Medley set are stamped on acetate. I colored the reverse side with Copic Markers and then ran them through the Xyron sticker machine. I applied green, orange and red glitters to them and attached them with glue dots. You will have to check out the Fruit Medley set...it has 15 images...and some cute sentiments! Yes, it's hard to believe that there are only two more days till Christmas. I have one last Christmas card to share with you and then I'll be putting away my Christmas stamps for another 10 months or so!!! I just love how the paper matches the image so perfectly! One of my favorite gifts to give is a set of handmade cards that my friends and family can use all year long. I have a great number of friends that are avid roller skaters. I have been working on sets of cards using Roller Baby just for them. I've embossed with swiss dots and added a little bit of shimmer with a clear glitter gel pen. I used a scallop rectangle for the backdrop of the skate. Black grosgrain ribbon finished these cards in style. I'm sure they'll be a hit. What is your favorite gift to give? Leave a comment and let us know what you like to give...we would love to hear from you. lastly, I leave you with one of my favorite roller skating videos. Have a great holiday. Using Spellbinders Label Eight and a stamp from the Warm Wishes set I created these cards. I cut the die cut shapes in half and can use the other half on another card. With the patterened paper that would be upside down if I kept the same layout I would just switch them to be on the bottom of the card. Last week I shared what I THOUGHT would be my last Christmas Card… Well, I was wrong. THIS is my last. For sure! But I’ll miss my rubber friends that I’ve shared many lovely hours with the last couple of months. For this card, I used the Christmas Tidings set. 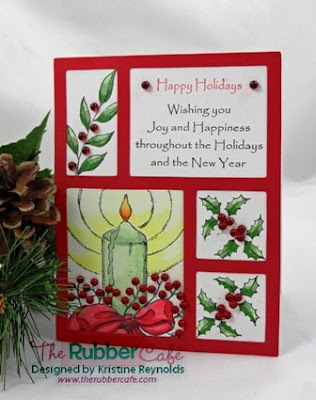 I stamped the candle stamp on white cardstock several times and colored the light and bow with copics. I cut it out and paper pieced it to get some dimension. Then I stamped the candle light on acetate and adhered the candle on top. Love the see trough effect! I wish you all a Merry Christmas!!!! I decided to play off of one of my favorite color combos....navy and white...it is so classic and beautiful! I combined some of my favorite Rubber Cafe images on this card, along with a favorite technique and a touch of embossing! Simple, quick and classy! So I have been thinking for days geese I should call my dear friend ... So today I went to call and found out that she had passed . I mean' t to call last week ... but didn't cause I was busy . Miss Kathy was a sweet woman sometimes taken the wrong way but a heart the size of TEXAS . She had 50 + years of stamping on me and taught me everything that she knew . In fact she is the one that taught me to color ... using watercolors. She hated the fact that I started using Copic Markers as she felt that I had a gift with watercolor and I was wasting it . I have several of Kathy's little pieces of artwork that she did and gave to me along the way . What a wonderful stamping friend I have , such and amazing lady .The Rubber Cafe was a thought at one point in time and Kathy and a few other wonderful friends gave me the push I needed and encouragement to get the ball started. I sure am going to miss her ... and her wonderful ideas ... So the purpose of my post today ... call that person that you have not spoke to in a while . Can you believe it's all ready Thursday again? It seems like the days between Thanksgiving and Christmas just fly by! Luckily I have found some time to stamp and came up with this fun card to share with you today. Thanks for stopping by today. Have a great rest of the week! Oh the Holiday adventures. First we have to get the cards out and gifts bought…or made…and then there’s the decorating. The holidays seem so busy, there always seems to be more activities and less time every year. Every year I tell myself I’m going to get all my cards done before it’s too late to send them. I’ll let you know how that works out for me next year…in the meantime…I did manage to get a few cards finished this year. This card is one of my favorites. It’s simple to put together and I was able to make several in just a few short hours. That’s my kind of card. 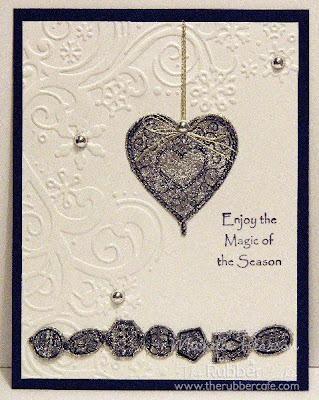 I used the star ornament from the Ornamental Holiday set and the sentiment is Elegant Merry Christmas. 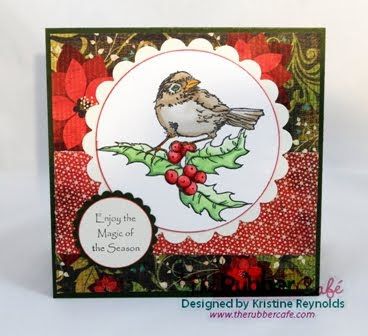 A little Jingle bell finished this card off in no time. Now…to get some gifts made. Thanks so much for stopping by. If you like what you see, you can find them at The Rubber Café online store. Our design team has worked very hard this year to bring you wonderful and fun art. Don’t forget to give them a little love now and then. We would really love to hear your comments. If there is anything you would like to see on the blog, please send us a note and we’ll make sure to give it a try. I'm sharing a very quick but cute little card/tag that I made to attach to some gifts. I used Spellbinders Label 8 and a sentiment from the Warm Wishes set. I corner punched the corners of the card, distressed the edges with brown ink, stamped my image and added a little bling. I pounded out 4 of these little guys in no time at all and will be likely making more tonight.... I love mini cards and tags I think they really make a present that little extra special. This is my last Holiday card for this year. And it was a fun one to make. Well its a hot one here .... 80 degrees ... I could tan today if I was into that kinda thing . So I checked the blog today thought I better post ... We are really trying to make sure that we post everyday for our followers. Yesterday I went to Stamping Details for our Famous Rubber Cafe Card Buffet ... and it was busy thank goodness that Annie came with to help out she was my saving grace. Below is a picture of Annie and Gram as we came to call her by the end of the day ... She was so cute ... scared that she would not be able to make all the cards and she made all seven and spent the whole day with us . Here is Yvonne hard at work ... she stayed for the whole day too ... getting all of her Christmas cards done. This is a small portion of the people that came to visit us ... It was so nice to see old friends and make many more new ones . WOW We gave out two huge gift bags full of products from The Rubber Cafe and some of the other companies that I work with . Sharron and Mom (as she introduced herself yesterday ) won these lovely bags and were so excited ... especially Sharron . Thank you to all those that came yesterday it was a real blast ... Hopefully we can do it again really soon. We have it .... its finally here the NEW BRAND NEW MAYA ROAD ... and lots of it . I am sitting here right now unpacking it all ... One for me one for the shelf ... Just kidding I am going to let everyone else have a crack at it first ... I can wait . 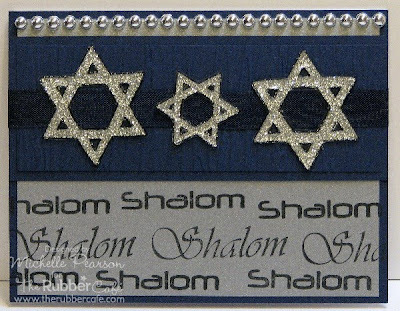 We have the new ribbons and flowers and books and embellishments ... I went online to buy a little more from them ... cause some of this stuff is so cute that its going to sell out right away ... that I thought that I would buy more . Even MAYA ROAD is sold out ... bummer ... I hope that she gets more in . Well here are some pictures of what came in today and I will have it all up online with in the next 30 minutes... I am so excited I could scream ... its cute . So I have been having alot of fun with this set .... I love it . This little guy makes cute cards and there are plenty of things that you can do with him .. just wait . Tomorrow The Rubber Cafe will be at Stamping Details doing our quarterly Rubber Cafe Card Buffet ... everything is kitted cut and ready to do I can't wait to see everyone again we always have so much fun . In all the Hustle and Bustle of Christmas remember to get your craft on ... take some time to your self. I hope your week has gone well so far. Thanks so much for stopping by to visit us here at The Rubber Cafe Design Team blog! I just love this card because of the lab. We have a 5 year old golden lab named Jadie and if we had snow I can just picture her sledding with the kids! I hope you enjoyed my card today and that the rest of your day is fabulous!!! There are so many choice when it comes to gift giving that most of the time you think to yourself..."I'll just send a gift card". Gift cards can look rather bland without some dressing up. I was in that same spot this week. This isn't a Christmas gift, but a birthday gift. My good friends' daughter is turning 10 this week and she loves books. I thought I would give her a gift card to the bookstore. At the same time, Melissa challenged us to use paper bags in our posts this week. Using a paper bag I created a couple of pockets perfect for the gift card and a little something extra. The gift card will go on the inside with the tag. On the front of the card I used Spellbinders Curved Rectange and Classic Diamonds. I inked up one of the embossing folders from the Cuttlebug Heritage set and embossed my Curved Rectangle. I stamped the Small Paisley Dragonfly on the diamond and added Glossy Accent to the wings. I added a Pearl Jelly dot to make it pop. On the inside I stamped "Let your imagination take flight" on a tall scallop rectangle also from Spellbinders. I used two diamonds and stamped the Small Trailing Butterfly on the smaller diamond. For the background I inked up the paisley embossing folder and embossed. I really love this technique because I think it gives it a fun letter pressed look to the background. 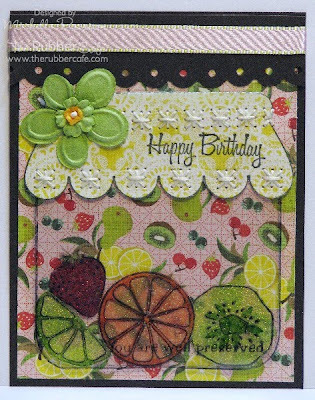 For the tag I stamped the "Happy Birthday" from the Birthdays and Balloons set. I have another pocket to fill...I'm thinking a little candy treat will go nicely. This card is for a girl, but there are so many saying and stamps that can easily change this card for a boy. One of my favorite little boys stamps is the Biplane. Check it out if you have time. Wow...there has been some great posts this week. I'm so happy to see the pugs. Aren't they great? Make sure you leave a comment and tell us what you think. You can also visit us on Facebook. 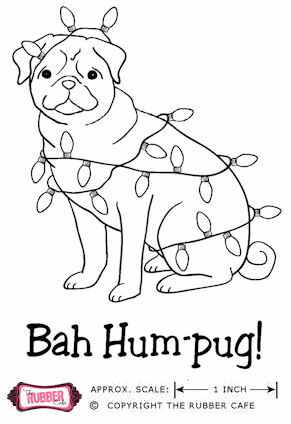 I have to tell you how excited I am about these stamp sets ... A Pug for the Holidays and Ba-hum-pug ... they were two years in the making . When this company first started we were called Pugnacious Stamps and Designs some of you may remember. Since then we have changed our name and go by The Rubber Cafe . 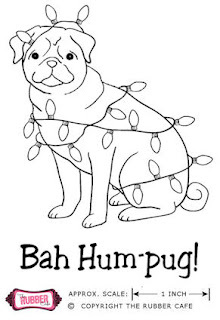 When we were Pugnacious people would always ask me for pug stamps ... I would try to find someone to draw them and no one could ever do it until now. There are lots of Pug Lovers out there so if you know one this would make a great gift ... Here is a cute idea using a paper bag ... I put it our there earlier this week to the design team to try and use a paper bag on their project . Some had already made cards for this post this week and others have more stuff coming ... but this is what I came up with . The paper bag wallet was inspiration off one of the blogs or Splitcoast Stampers ... I can not remember ... but it was cute . Hope that you are having a great day .... Remember Craft supplies and paper kits make great Christmas gifts. Hi folks! I sthart the new week with a CAS card, using the Warm Wishes set. I used a textured white cardstock and a green mat. Very easy, but with some pop dots to give it all dimension it turned out pretty nice. I love this branch stamp. So versatile, so classy! I’m about to start sending my over seas cards out. Are you??? I made this little christmas "album" from a paper lunch bag. I'm sure you'll see more this upcomming week as Melissa has challenged all of us design team members to see what we could come up with....so here it is, hope you enjoy. On this page I stamped with versa mark on the red paper to make my own patterned paper. 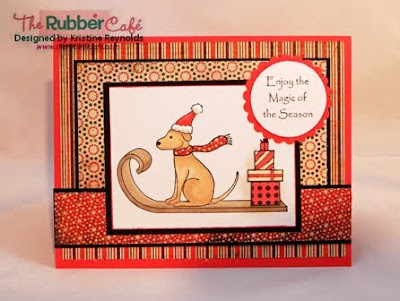 Today I am sharing a trio of cards using images from The Rubber Cafe. The first card uses the Celebrating The Festival Of Lights set. 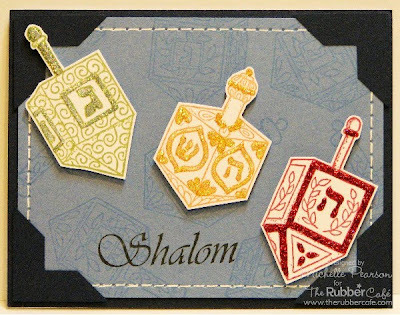 I stamped the dreidels in different ink colors and then glittered parts of them with coordinating glitter for some tone on tone interest. The background is also stamped tone on tone. I added a bit of faux stitching and some photo corners to finish off the card. A fun way to color without using pencils or pens! For this card I used the Glitter and Acetate technique on the stars with silver glitter. I cut the stars out and put them over an embossed panel and some vintage seam binding. 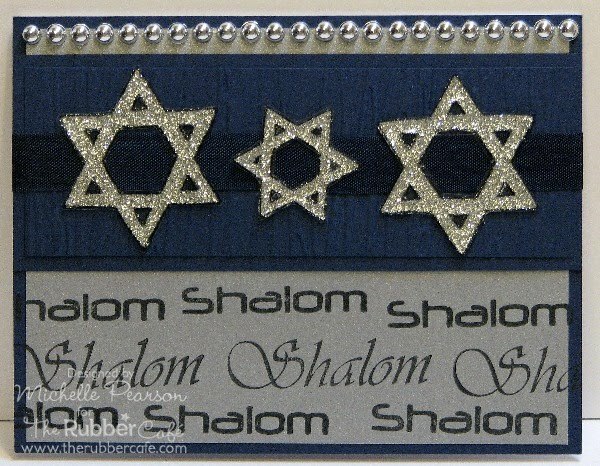 I used the stamp aligner to stamp Shalom as a border along the bottom of my card with Stazon ink on the metallic paper. Most of the images on this card come from the Tree of Life set. One of the stars comes from the Celebrating the Festival of Lights set. This final card features the Tree of Life stamp that has been silver embossed over a polished stone panel. The embossed panel has actually been double-embossed! I ran it through the script embossing folder and then through the branch one. This gives the panel a beautiful subtle effect. 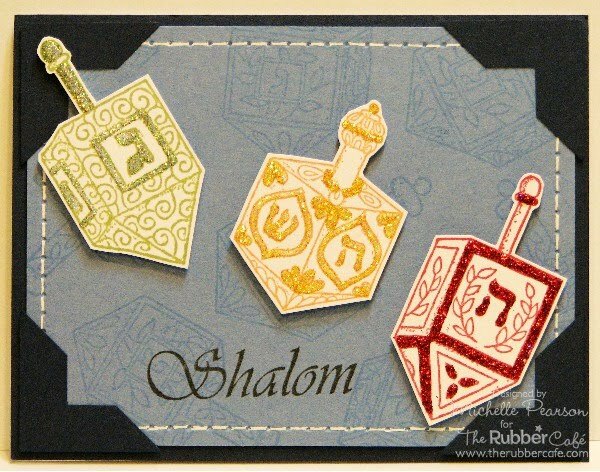 I finished the card off by stamping Shalom in a flat area on the card. Well it has been one of those weeks ... We have not stopped here at The Rubber Cafe . We have a new stamp release for next week and for all of you pug lovers out there this one is a must have. I am sure that you all want to see ................but .......................I am not going to show it until next week. 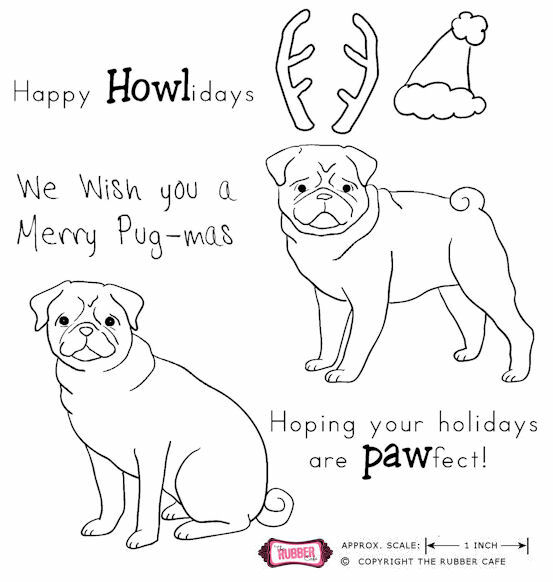 Its going to be great for some of those last minute dog lovers cards. 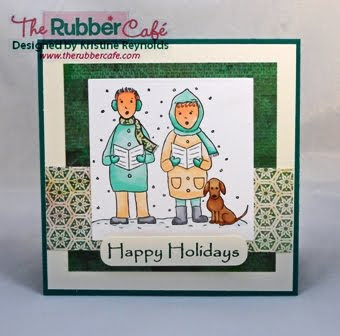 Next week-end Dec.11th I will be teaching at Stamping Details in Poway, Ca.. We are doing our quarterly Cafe card buffet ... for more details be sure to check out Stampingdetails.com under classes . This card was quick and easy .... I stamped Background Basics with the white pigment ink about 1.5 inches from the bottom of the card . Put some faux stitching on the top and the bottom of the stamped image to frame it in. Embellished with some pearls. For the snowflake I colored the button in with my Copic marker and put that to the side to dry. The I took out Scraphappy Glue and drew the design on the snowflake ... sprinkled with clear glitter and put that aside to dry . The best part about Scraphappy glue is that it has a very fine tip and it makes it possible to do small piece work. I hope that you all have a really great week-end and make sure that you check back .... If you like this card show me some LOVE post a comment ... tell your friends about us , friend us on Facebook ... Tell us what you want to see and learn. If it's Thursday it must be my turn to share a card with you! This card took a little longer than most of the cards we've been sharing but the recipient will love it! I used stamps from Christmas Tidings for this card and colored the images with copic markers. The berries are Holly Berry Jelly dots. The jelly dots turn this card into something special! This isn't a card I would try to mass produce but someone special would appreciate the time and effort that it took to color. I hope your enjoyed this project.